Galley Wench Tales: Wanna Sail Away? we owned before our Pearson 365 sailboat. $2,500 for it. We loved that little boat. Just sailing away (or cruising if you're serious about going the distance as I talked about on NPR's Closing the Loop - link to GWT audio)... whether you consider the notion exciting, romantic, terrifying, or crazy these days out of a world population of 7 billion, there's about 10,000 of us cruising. * We are a rare breed, but we're not alone. When my captain and better half Wayne and I chat with folks intrigued with the idea of cruising, we hear a lot about fears and excuses. And we know what it takes to "just go." That conversation happens with such frequency and regularity, it's captured in this "Just Go" blog post about cruising (click here for that). 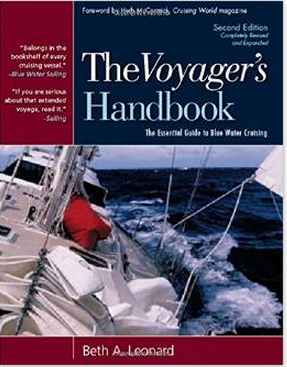 Whether you're serious or just curious about blue water cruising, there is one truly definitive book I recommend above all others on the topic: "The Voyager's Handbook: The Essential Guide to Blue Water Cruising" by Beth Ann Leonard. With over 110,000 nautical miles of sailing and two complete circumnavigations, Beth knows her stuff. were deciding if we wanted to go cruising. What I appreciate most is Beth goes well beyond her own experience, and integrates a ton of research from other sailors. Best of all, she boils it down into a clear, easy to understand description of what it's like, from the very beginning addressing the fears and concerns most of us have who consider long term sailing. Beth even takes into account this kind of sailing is not a one-size-fits-all endeavor. We too know of sailors whose boat seems to be held together by duct tape and sheer guts and whose diet seems to consist more of beans and rice and rice and beans (and a lot of fish and coconuts)... to substantially sized boats with all the bells and whistles and the ability to for its captain and crew to fly away several times a year. Bottom line: whatever level you're at, Voyager's Handbook is for you. Dana Greyson, cruising the Bahamas in 2014. 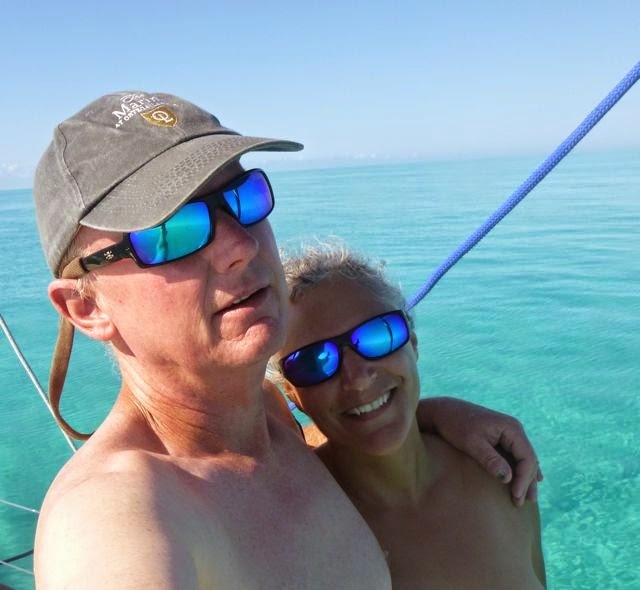 As for us, after our first year, sailing a new-to-us boat 1600 nautical miles through a myriad of typical and incredibly frustrating "new" boat owner breakdowns, our confidence was shattered. Yet, along with the lows, we were well on our way to appreciating the "1,000 sunsets" my husband promised at the start of our journey. 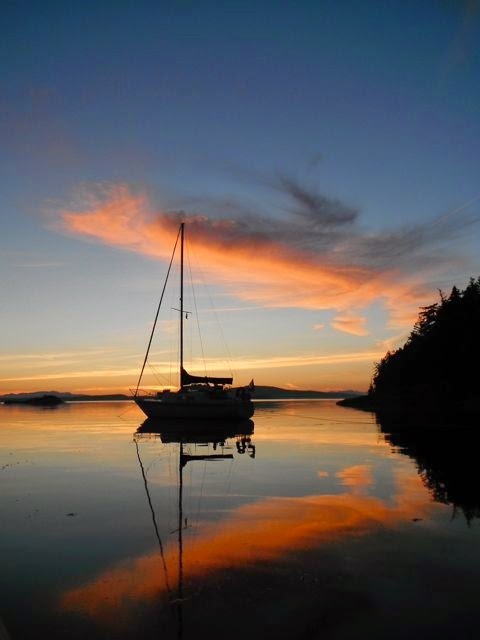 We love the simplicity and beauty of sailing and feel incredibly lucky we are able to do it. Last year, instead of our initially planned foray down to Panama, through the canal, into the South Pacific and off to Australia (the land of Oz), we traveled the more popular cruising grounds of the Bahamas. We've now sailed to 13 countries and over 4,000 nautical miles. Thanks to that and some upgrades and repairs to our boat (thank you West Marine for your terrific employee discount! ), our confidence is restored and we're ready to resume our plans to head to the South Pacific. Considering on our boat we share a mere 150 or so square feet (though with one helluva back yard) for a long, long, time, restoring our confidence was pretty danged important. As for you, now that you've read this, what are your plans? *In his Cruising World article "Where We Explore" Jimmy Cornell defines cruisers as "People who set off on a long voyage, usually of several years, whose aim is to eventually complete a circumnavigation" (though only about 150-200 boats do, annually). work yard. It was not one of our better days. At the moment we're engaged in one of the least glamorous aspects of sailing, the true nitty-gritty of getting our boat ready to resume sailing after hurricane season. 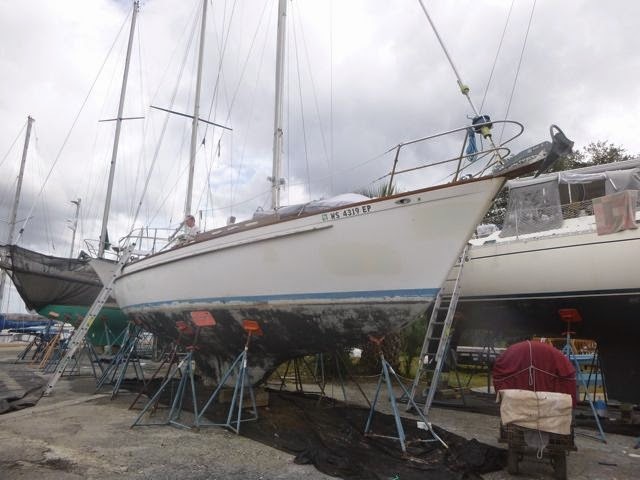 This week our boat, Journey, a 36 1/2 foot 1977 Pearson 365 sailboat, moved from storage into the work yard at Green Cove Springs, Florida. Lots of sweat, angst, dirty fingernails and some level of pride, satisfaction and excitement. We're set to "splash" November 18th, and plan to set sail this December for Panama and the South Pacific. While we've considered circumnavigation, our goal is to arrive in Australia in two years. That's 8,000 nautical miles "as the crow flies;" we may well sail three times that by the time we arrive.